This wasn't quite what I was expecting, and it wasn't outstanding, but it was good. More like a coffee cake than a dessert, it was soft, moist, and not overly sweet...which is maybe what I was expecting. The "crumb" topping was just the dry batter ingredients with butter cut in...and way too much flour. I don't usually like nuts in my baked goods, but it almost seemed like the nuts were missing from this recipe. 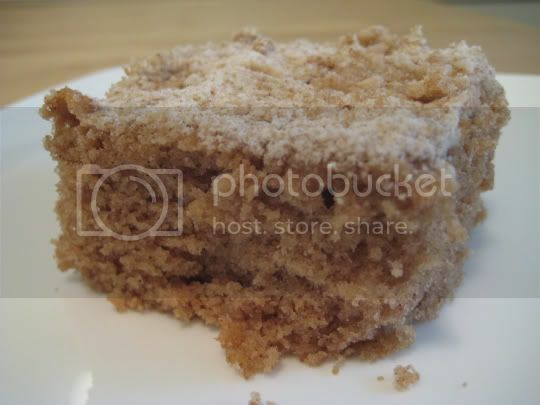 The cake was also extremely crumbly (well, it was crumb cake), but I was expecting something a little more dense and solid. Make again? Probably, but I'm in no rush. My Taste of Home booklet has plenty of coffee cake recipes I'd try first.